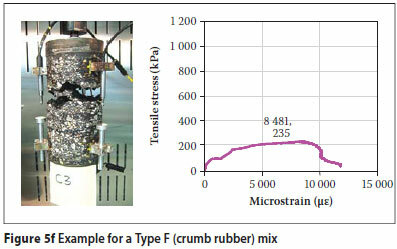 As a means to investigate the applicability of the direct tensile strength (DT) test as a surrogate fatigue crack test, the ductility and fatigue crack resistance potential of various asphalt (HMA) mixes were evaluated in the laboratory using the DT test, at ambient temperature (20ºC) and a displacement loading rate of 1,27 mm/min. Various HMA mixes were included in the DT test program and the results were compared with those of the Overlay Tester, also conducted at ambient temperature. Up to 23 commonly used Texas HMA mixes with different mix design characteristics were evaluated and are discussed in this paper. The results indicated that the mix design volumetrics, such as the asphalt binder content and aggregate gradation, play a significant role in the ductility and fatigue crack resistance potential of HMA mixes. The dense-to fine-graded HMA mixes with high asphalt binder content exhibited better ductility potential and laboratory fatigue crack resistance than the coarse- and open-graded mixes. Overall, the DT test was found to be a promising surrogate fatigue crack test for mix design and HMA mix screening for fatigue crack resistance in the laboratory. Recommendations to improve the test protocol are included in the paper. However, sample fabrication and test set-up were the two critical issues found to be associated with the DT test. 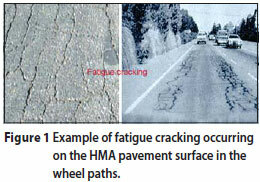 Fatigue cracking is one of the major structural distresses prevalent in today's hot-mix asphalt (HMA) pavements. Ensuring adequate mix fatigue crack resistance is one way to minimise this distress. However, mix fatigue crack resistance, which can be defined as the measure of HMAs' ability to withstand fatigue cracking, is a complex function of many variables including HMA mix design characteristics, traffic, pavement structure and the environment. These factors interact differently to produce varying effects on the fatigue performance of HMA mixes and should be discretely taken into account when modelling HMA mix fatigue crack resistance in the laboratory. Figure 1 shows an example of fatigue cracking on an HMA pavement surface manifesting as alligator cracks in the wheel paths. Proper laboratory fatigue characterisation of HMA mixes thus constitutes a fundamental and integral component of HMA design and analysis to ensure adequate field fatigue performance. Additionally, mix laboratory fatigue characterisation is an ideal screening platform for selecting appropriate materials and developing suitable HMA mix designs that are fatigue crack resistant. However, most existing laboratory test methods for evaluating mix fatigue resistance, such as the bending beam fatigue test, are empirical in nature, laborious, lengthy and often do not characterise the fundamental material properties of HMA mixes that are directly related to fatigue performance (Tayebali et al 1992). Most often, such empirical test methods not only fail to produce fatigue crack-resistant HMA mixes, but are also impractical for routine mix design applications. The flexural bending beam fatigue test, for instance, is ideal for scientific or applied research purposes, but it is not readily applicable for industry routine purposes or daily mix design screenings due to the complex nature of the sample preparation process and the lengthy test time. Furthermore, some of the cracking tests, such as the flexural and diametral fatigue tests, are reported to be associated with high variability in the test results and poor repeatability. Carl Monismith, in the SHRP study for instance, reported coefficients of variation (CoVs) greater than 50% based on a minimum of 32 replicated specimens (SHRP 1994). 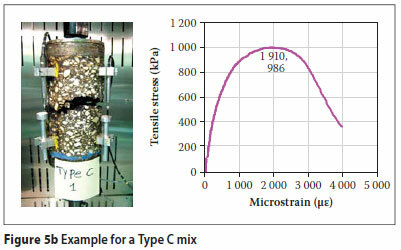 Based on a continuum micro-mechanics fatigue analysis approach (the Calibrated Mechanistic approach with Surface Energy [CMSE] measurements) which was developed at Texas A&M University, the uniaxial direct tensile strength test (DT test) was investigated as a surrogate laboratory test for rapid mix evaluation and routine screening of HMA mixes for fatigue crack resistance (Lytton et al 1993, Si 2001, Cheng 2002, Walubita 2006, Walubita et al 2006). The research methodology used by Walubita et al (2006) for developing the CMSE method involved establishing tentative fatigue threshold values based on the measured DT properties, predicting the mix fatigue life (Nf) based on the CMSE method, and then comparing the predicted Nf with the anticipated traffic loading expressed in terms of single equivalent axle loads (ESALs). The material properties for the HMA were measured and characterised in terms of the tensile strength (σt) and the tensile strain (εf) at maximum stress. During subsequent analyses, the εf parameter was analytically found to be a better discriminator between fatigue and non-fatigue crack-resistant HMA mixes in the laboratory compared with the σt parameter (Walubita et al 2007). This is the parameter of primary focus in this study. Although more laboratory testing and field validation are still warranted, the proposed εf threshold and CMSE model for characterising HMA mix fatigue resistance are given in Equations 1 and 2 respectively (Walubita et al 2006, Walubita et al 2007). In Equation 2, Q is the reliability factor that accounts for HMA mix characterisation and for traffic prediction variability and the anticipated uncertainties in the HMA mix fatigue performance during service. Traffic DesignESALs is the total number of traffic design ESALs (80 kN) estimated over a given pavement design period, such as 20 years (Walubita 2006). In Equation 2, both Ni and Np are functions of HMA material properties and include the measured tensile stress property, σt (Walubita et al 2006). Full details of the CMSE fatigue analysis models are published elsewhere (Walubita 2006, Walubita et al 2006, Ofori-Abebresse 2006). The results obtained, based on CMSE laboratory testing and subsequent data analyses with Equations 1 and 2, were promising and reflected the potential of the DT test as a surrogate fatigue test protocol for evaluating mix fatigue resistance in the laboratory (Walubita et al 2006, Walubita et al 2007). Based on the numerous HMA mixes and laboratory test conditions considered, the DT test proved to be rationally much simpler, faster and more practical than the other test methods that were evaluated, such as the relaxation modulus, repeated direct tension, and the bending beam (Walubita et al 2006, Walubita et al 2007). The main objective of the work was to characterise and evaluate the ductility and fatigue crack resistance potential of various HMA mixes in the laboratory based on the DT test at ambient temperature (20ºC) and under a displacement loading rate of 1,27 mm/min. The second objective was to rank the evaluated HMA mixes in their order of fatigue crack resistance, based on their ductility potential (measured in terms of the εf parameter) and subsequently to compare the DT results with those of other laboratory cracking-related tests, such as the Overlay Tester. Concurrently, the third objective was to evaluate the DT test protocol and suggest further improvements for both test simplicity and accuracy of the results. To achieve these objectives, up to 23 typically used Texas HMA mixes with different mix design characteristics were evaluated. The research methodology included carrying out the direct tensile strength test on the HMA mixes at ambient temperature (20ºC) and then comparing the results with those of the Overlay test, also conducted at room temperature. HMA test specimens were fabricated from different mixes and corresponding field cores representing various in-service Texas highways. A statistical review of the DT test repeatability and variability is also given in the paper. As this was purely a laboratory research study, no field data or field validation of the DT test method is included. 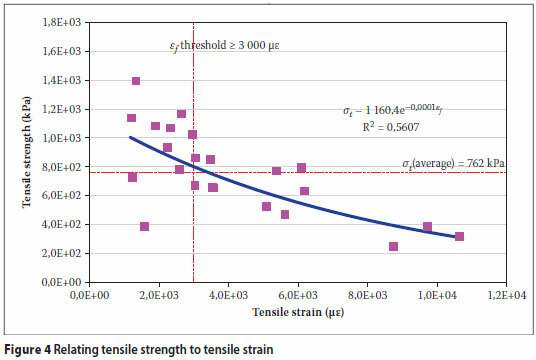 In this study, the uniaxial direct tensile strength test (DT test) was used to measure the HMA tensile strength and tensile strain at maximum stress as a means of characterising and evaluating the ductility and fatigue crack resistance potential of HMA mixes. The DT test parameters consisted of a continuous axial tensile loading at a displacement rate of 1,27 mm/min. Trial testing with different displacement loading rates did not yield favourable results, i.e. the rate was either too slow or too fast to capture reasonable data and therefore 1,27 mm/min was selected (Walubita 2006). 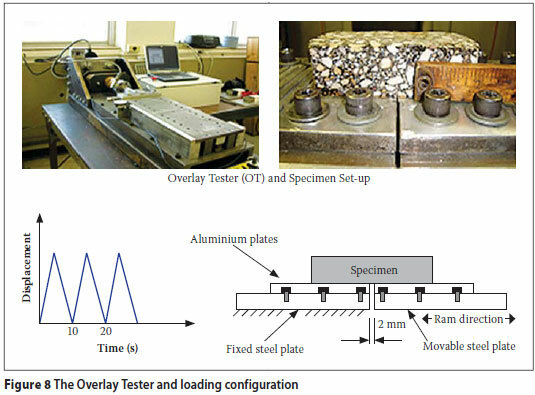 Figure 2 shows the laboratory test set-up and loading configuration for the DT test conducted in this study. For a displacement loading rate of 1,27 mm/min, the DT test duration was at most 5 minutes. The test was conducted at ambient (20ºC) temperature with a minimum preconditioning time of 2 hours. This temperature was monitored via a thermocouple probe attached inside a dummy HMA specimen, placed in the same environmental temperature chamber as the test specimens. As shown in Figure 2, the DT specimens were cylindrically shaped with dimensions of 100 mm in diameter by 150 mm in height, gyratory moulded to a target air void level of 7 ± 0,5% (TxDOT 2007). From the test, the DT output data of importance are the tensile strength (σt) and tensile strain (εf) at maximum stress, calculated as shown in Equations 3 and 4 respectively (Walubita 2006). L0 = initial distance between the linear variable displacement transducers (LVDTs) (mm) centre to centre, which was 100 mm (Figure 2) in this study. In terms of the linear-viscoelastic behaviour of HMA, σt is indicative of the HMA mix stiffness. The parameter εf, on the other hand, is indicative of the ductility potential or flexibility of the HMA mix. Within the context of the DT test, the εf parameter is also defined as a parametric measure of the HMA's stretchability or potential to elongate prior to crack or break failure under tensile loading. Interpretively, a higher σt value will generally indicate high stiffness, while a higher εf value is indicative of a more ductile or flexible mix. A higher εf value is thus desired and is theoretically construed to indicate greater ductility (or flexibility). In turn, the ductility potential was utilised as an indicative measure of HMA fatigue crack resistance. Up to 23 different mix designs representing different HMA mixes used on various inservice Texas highways were evaluated. The various in-service highways also represent different field conditions, including traffic loading and the environment. These inservice highways also present a future opportunity to monitor the performance of these mixes and validate the DT laboratory results presented here. A wide spectrum of typically used Texas HMA mixes was evaluated. These ranged from Texas high asphalt binder content, fine-graded mix types to moderately low asphalt binder content, coarse-graded mix types. In total, nine typical Texas mix types (with up to 23 different mix designs) were evaluated; they are listed in Table 1. This experimental design incorporated mixes that have historically exhibited satisfactory fatigue crack performance in Texas (e.g. 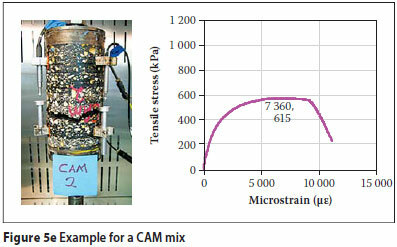 the CAM mixes) and those with a known history of poor fatigue crack-resistance performance in Texas (e.g. the Type A mixes). 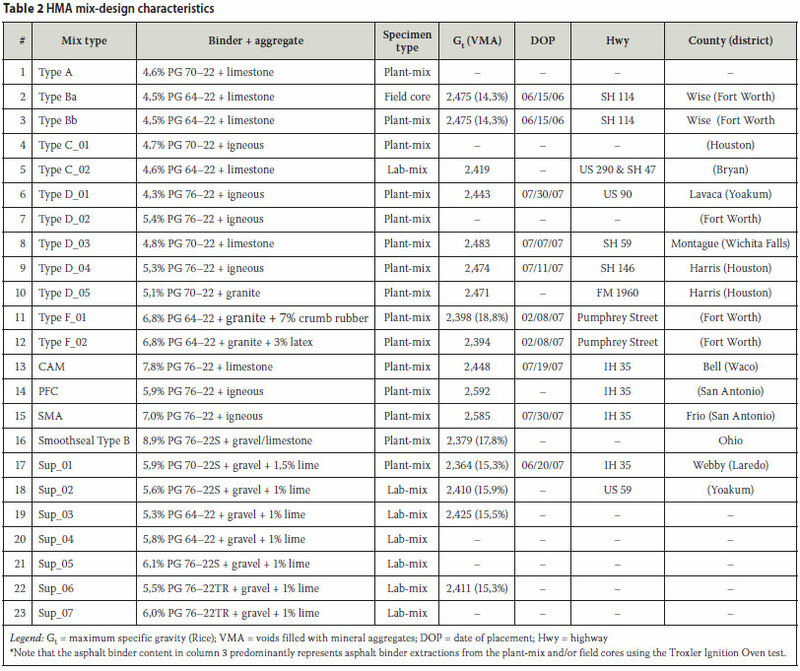 The mix design characteristics for the specific mixes are listed in Table 2, which includes field data from where some of these mixes have been placed. A minimum of two replicate specimens were fabricated and tested for each mix type. The specimens were moulded from raw materials directly sourced from the material suppliers and denoted as lab-mix, plant-mix hauled from the project site at the time of construction and denoted as plant-mix, or cores extracted from in-service highway pavement structures and denoted as cores. In general, a minimum of two replicate specimens is recommended for the DT test. However, three replicate specimens are preferred (Walubita 2006). The average DT laboratory test results are listed in Table 3 and include the air voids (AV), the temperature, the maximum tensile load at failure (Pmax), the tensile strength at failure (σt), the tensile strain (εf) at maximum stress, and the coefficient of variation (CoV). If εf > 3 000 µε is used as the threshold as proposed in Equation 1, Table 3 would suggest that only the following mixes exhibit potential for adequate fatigue crack resistance: Type D_05, Type F_01, Type F_02, CAM, SMA, Smoothseal Type B, and all the Superpave mixes _01 to _07. These results are also consistent with the mix design characteristics shown in Table 2, which indicate relatively higher asphalt binder content - over 5,0% - for these mixes with an aggregate gradation of either fine, dense or gap graded. In fact, the asphalt binder content for the Type F, CAM and Smoothseal Type B mixes, which exhibit the greatest ductility based on the greater magnitudes of εf values, is over 6,0%. These results therefore suggest that asphalt binder content plays a very significant role in the ductility and fatigue crack resistance potential of HMA mixes. This is clearly evident when comparing the Superpave mixes. Figure 3 is a comparative illustration of the average εf values for each mix type plotted against the εf > 3 000 µε threshold. Figure 3 clearly shows that all the Type A, Type B, Type C and PFC mixes and most of the Type D mixes evaluated in this study did not meet the εf > 3 000 µε threshold and would, therefore, be judged as having inadequate laboratory fatigue crack resistance based on this DT criterion. Theoretically and with respect to the anticipated in-service performance, these results suggest that these mixes could have potential for exhibiting fatigue crack-related distresses in the field over time. Interpretively, the higher the εf value in magnitude, the more ductile the mix is and, theoretically, the greater the potential for fatigue crack resistance. Based on the εf values shown in Table 3, the rank order of potential for adequate fatigue crack resistance would be the Type F mixes, followed by the Smoothseal Type B and CAM mixes. The least fatigue crack resistant would be the Type A mix. As listed in Table 2, this mix is typically designed as a coarse-graded mix (25 mm NMAS) with a moderately low asphalt binder content (often in the range of 4,0 to 4,7%) and is predominantly valued for its rutting resistance functions, typically being used in high-volume and heavily trucktrafficked highways (Walubita & Scullion 2007). The Type A mix design characteristics, compounded by a poor AV distribution structure due to the coarser aggregate, contribute significantly to the poor ductility and fatigue crack resistance properties of this mix. The PFC is a porous mix by design with high voids content, typically used for its skid resistance and surface permeability characteristics. In Texas, PFC mixes are in fact designed and placed at around 10 to 20% AV in the field. Therefore, the PFC's failure to meet the εf > 3 000 µε threshold was not unexpected. High AV mixes are often highly susceptible to cracking and have poor fatigue crack resistance. Fine-graded mixes like the CAM, Type F and Smoothseal Type B mixes, which have a closed and more uniform AV distribution structure, often tend to exhibit superior fatigue crack resistance properties. It can be seen from Table 3 that the maximum failure tensile load (Pmax) ranges from 1,9 to 11,3 kN, with an average of 6,1 kN, for all the mixes evaluated. For the Type D and Superpave mixes, the average Pmax values are 8,2 and 5,6 kN respectively. The loading (Pmax) is generally higher for the Type A, B, C and D mixes. The lowest values observed are for the Type F and Smoothseal Type B mixes at 2,0 and 3,1 kN respectively. A similar trend was observed for the tensile strength, with a range of 248 to 1 393 kPa and an overall average of 762 kPa. The average σt values for the Type F, Smoothseal Type B, Superpave and Type D mixes are 283, 386, 703 and 1 014 kPa respectively. For the mixes tested, σt generally appears to exhibit an inverse proportional relationship with εf, i.e. the higher the σt value, the lower the εf value and vice versa. In fact, Figure 4 shows an exponential relationship for the mix types evaluated in this study. These results suggest that a stiffer brittle mix will fail at a higher σt value and lower εf value. A softer (flexible) ductile mix, on the other hand, will fail at a much lower σt value and higher εf value, as shown for the mixes on the right side of the 3 000 µε line in Figure 4. That is, a softer flexible mix will require less tensile loading to stretch it to the failure point than a brittle stiff mix. By contrast, a softer flexible mix has greater potential to elongate more than a brittle stiff mix prior to crack or break failure when subjected to the same tensile loading. For the PFC mix, however, the above hypothesis does not seem to hold. Both the σt and εf values are relatively low in magnitude. This is primarily due to the porous nature of the PFC mixes, i.e. high AV content - greater than 10%. Nonetheless, these observations and hypotheses relate to the mixes tested and may be subjective if different arrays of mix types are considered. With respect to material property characterisation, a higher σt value is often construed to indicate a stiffer and more brittle mix, which is undesirable for fatigue crack resistance. Thus the mixes below or on the left side of the 3 000 µεf line in Figures 3 and 4 would not, theoretically, be desirable. By contrast, the higher the εf value, the more ductile the mix and, theoretically, the greater the potential for fatigue crack resistance. So, mixes above or on the right side of the 3 000 µε line in Figures 3 and 4 would, theoretically, be desirable. 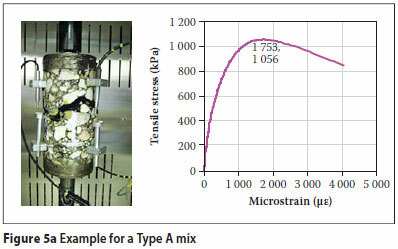 Figures 5a to 5f show some examples of the plot of tensile stress versus strain for some selected mixes and include photos of the specimens at tensile failure, and Figure 6 is a comparison of the HMA ductility potential for some selected mixes. With reference to Figures 5 and 6, the potential of a mix to elongate prior to failure at break under tensile loading was considered as indicative of its ductility potential. This elongation is indicated on the horizontal X-axis as the failure tensile strain. Based on this definition, the Type F and Smoothseal Type B mixes with the greatest elongation would thus be considered as the most ductile mixes with great potential for fatigue crack resistance. As is evident in Figures 5 and 6, these mixes generally required little tensile force, measured in terms of the stress, to stretch the mix up to point of failure. The Type A mix is the least ductile, based on the smaller magnitude of εf at σt max. 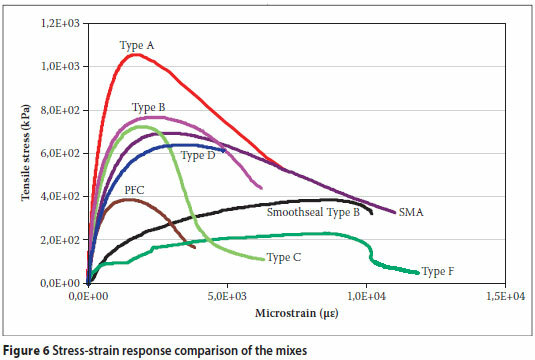 If the ratio of stress to strain in the linear portion of the curves is assumed to represent the linear-elastic modulus of the mixes, it is easy to conclude that the Type A mix is the stiffest and the Type F mix the least stiff, i.e. most flexible with the lowest modulus in magnitude. The large stress magnitude of the Type A mix on the vertical Y-axis indicates that at the same displacement loading rate, a large tensile force is required to stretch the mix. This means that with its high stiffness and substantial resistance to elongation, the mix is more likely to break than stretch when subjected to tensile loading - a typical characteristic behaviour of brittle materials with poor ductile properties. However, it should be emphasised here that the ultimate field performance of any given HMA mix is also dependent on many other interactive factors, such as the pavement structure (i.e. layer thicknesses), traffic, environmental conditions, construction effects (i.e. construction methods and quality control), etc. So, when evaluating or predicting field fatigue crack performance, these factors should not be excluded. If 30% is arbitrarily used as the threshold, all the CoV results shown in Table 3 would be judged as acceptable, indicating that the repeatability and variability of the DT test protocol is reasonable (Medani et al 2004). In fact, only the CoV value of the Type A mix at 29% is considerably high. This was not surprising because of the greater heterogeneity and poor AV distribution of the Type A mixes, arising predominantly from the coarser aggregate gradation and poor workability of these mixes. This mix also exhibited the highest AV variability compared with the rest of the mixes in Table 3. 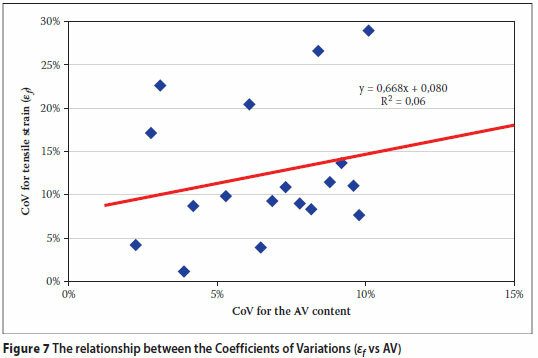 According to Table 3, the CoV for the AV content of the Type A mix, based on five replicate specimens, was 10,1% versus an overall average of 6,4% for all the mixes considered in the study. All of the other mixes had CoV values below 30%. In general, the fine-graded mixes were observed to exhibit lower variability in terms of both the AV and DT test results than the dense- to coarse-graded mixes. The coarse-graded mixes were generally associated with high variability. Among other reasons, the fine-graded mixes' lower variability was attributed to their good workability characteristics which allows easy specimen fabrication, better mix homogeneity, and better and more uniform AV distribution. Note, however, that additives such as crumb rubber and latex or the use of stiffer polymer-modified asphalt binders such as PG 76-22 tend to have a detrimental impact on the workability of the mixes, and thus high variability may be observed in the mix, e.g. see the Type D_04 and CAM mixes in Table 3. The coarsegraded mixes, on the other hand, are comparatively difficult to work with and so it is equally difficult to maintain a consistent and uniform AV distribution in the specimens. Comparing the material properties, the rank order of increasing variability in terms of the CoV is Pmax, σt, and εf. Based on Table 3, the CoV range for Pmax is from 2,1 to 15,9%; 3,1 to 19,7% for σt; and 3,9 to 29% for εf. However, it was apparent in this study that variability in the DT test results also depended to some extent on the AV variability, which is ultimately a function of mix workability and the specimen fabrication process. In fact, the results in Table 3 exhibit a near-linear proportionate relationship between the CoV for the AV and that for εf (see Figure 7). Thus proper sample preparation and maintaining consistency in the AV content/distribution is one critical approach to minimising variability in the DT test results. To compare mix cracking resistance in the laboratory, the Overlay test was also conducted to supplement the DT test results. The Overlay Tester (OT) is used as a simple performance test for characterising the cracking (reflective) resistance potential of HMA mixes in the laboratory at a test temperature of 25ºC (Zhou et al 2006, TxDOT 2007). The OT is a Texas standardised test method Tex-248-F (TxDOT 2009). The OT test loading configuration consists of a cyclical triangular displacement- controlled waveform at a maximum horizontal displacement of 0,63 mm and a loading rate of 10 s per cycle (5 s loading and 5 s unloading). Like the DT test, the OT test was conducted at 20ºC in this study. The OT test specimens are 150 mm in total length, 57 mm wide and 37,5 mm thick. Figure 8 shows the OT machine and a schematic representation of the OT loading configuration. More details of the Overlay test method can be found in Zhou et al (2006) and TxDOT (2009). In this study, the cracking (reflective) resistance of the mixes under the OT testing was measured in terms of the number of repetitive OT load cycles (NOT) to failure, where failure is defined as a 93% reduction in the initial maximum load measured at the first load cycle. Based on the current OT failure criterion, HMA mixes that last over 300 load cycles to failure at a stress reduction of 93% in the initial load are judged as acceptable (i.e. NOT > 300) (Zhou et al 2006). This was the failure criterion adopted as the benchmark in this study. For 300 load cycles, the OT test duration took 50 min. 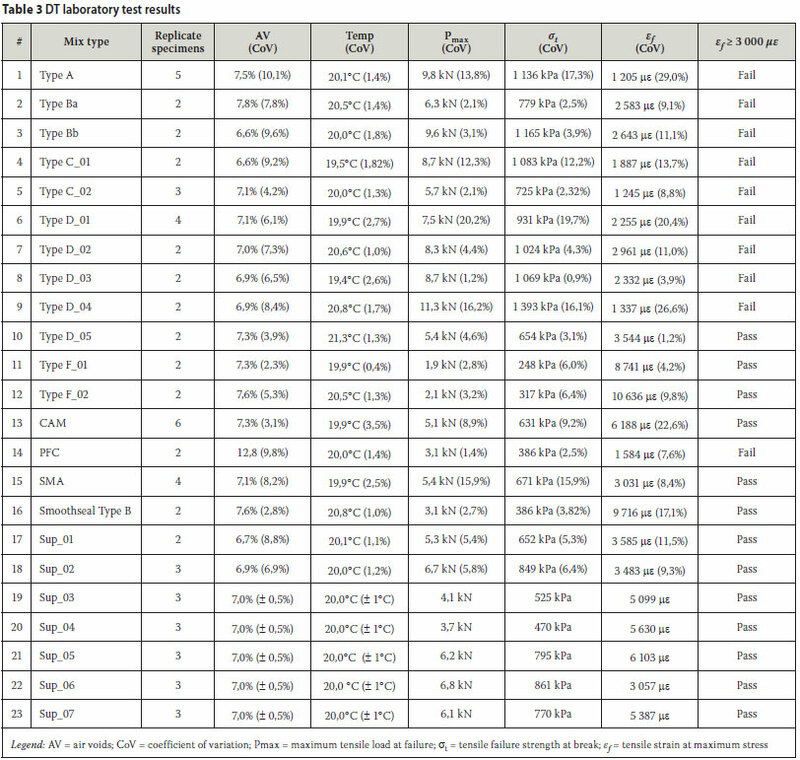 The OT results for some selected HMA mixes from Table 2 are shown in Figure 9. Like the DT test, the OT results in Figure 9 indicate that only the Type F, CAM, Smoothseal Type B and Sup_01 mixes indicate potential for sufficient cracking resistance based on the adopted NOT > 300 failure criterion. Even after over 900 repetitive (cracking) load cycles, the average load reduction in these mixes was only 87%, versus the 93% threshold. The SMA mix would also be judged as acceptable since it meets the proposed threshold. In agreement with the DT test results, all the other mixes listed in Figure 9 would be considered as having inadequate laboratory crack resistance and as potential suspects for cracking-related distresses in the field. 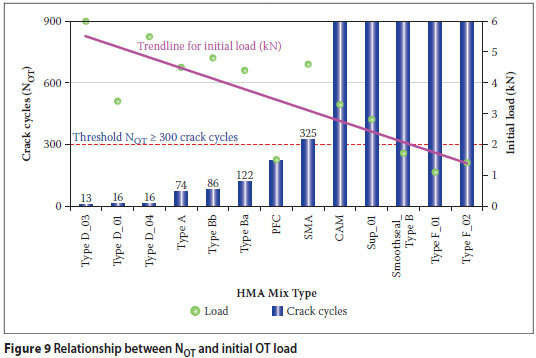 With the exception of the PFC mix, the initial maximum load appears to be inversely related to the number of crack load cycles to failure as shown in Figure 9, in particular the fitted trendline for the "initial load". Mixes with the highest load magnitude generally have the lowest NOT and those with the lowest load magnitude the highest NOT. In fact, the average load magnitude for all the mixes considered to be crack resistant with NOT greater than 900 was computed to be 2,1 kN, with a CoV of 4,6% and a range of 1,1 to 3,3 kN. For the mixes with NOT less than 300, the initial load was greater than 3,3 kN, with a measured maximum of 6,0 kN. 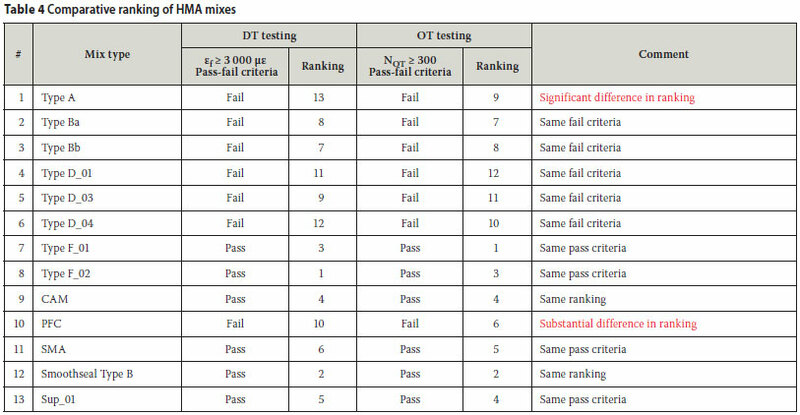 This section provides a ranking comparison of the HMA mixes based on the DT and OT testing. The test protocol variability is also discussed including some suggested improvements to minimise variability. Table 4 is a comparative ranking of the HMA mixes for ductility potential and laboratory fatigue crack resistance based on the DT and OT testing. It shows that only two HMA mixes are ranked similarly by both the DT and OT tests, namely the CAM and Smoothseal Type B mixes. For the other HMA mixes, there are some differences in the ranking, with a substantial difference noted for the PFC and Type A mixes. According to Table 4, the OT ranks the PFC mix at #6, while the DT ranks it at #10. Given the porous nature of the PFC mix and considering the other HMA mixes, it is easy to assume theoretically that the DT ranking is more reasonable than the OT ranking. In addition, one would theoretically expect the coarser Type A mix to be at the bottom of the OT ranking just as in the DT ranking; but this is not the case with the OT ranking. 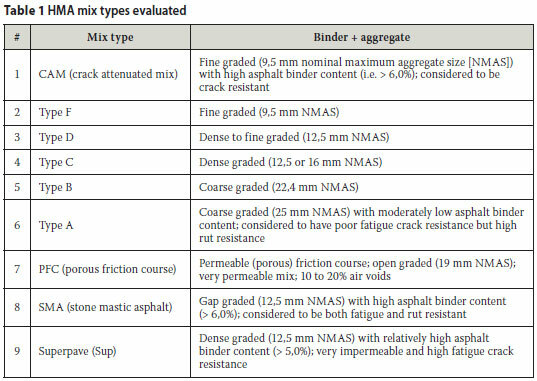 Therefore, it can be inferred that the test protocol type also has an influence on the response behaviour of the HMA mix with respect to fatigue crack characterisation, that is there is always a possibility that different test protocols may rank the same HMA mixes differently, as shown in Table 4. However, if the pass-fail criterion is used for each test type, i.e. εf > 3 000 µε for the DT test and NOT > 300 for the OT test, the results are essentially the same. 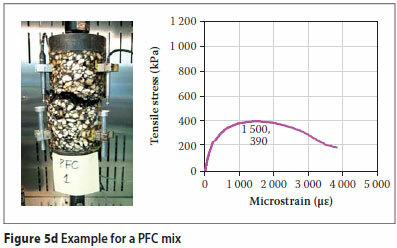 Both test protocols classify mixes #1 to #6 and the PFC mix (#10) as having insufficient laboratory fatigue crack resistance and the rest as having sufficient laboratory fatigue crack resistance. When analysing Table 4 in conjunction with Table 2, it can be further noted that there is a strong relationship between the asphalt binder content and the fatigue crack resistance ranking of the mixes. In general, the HMA mixes with higher asphalt binder contents are ranked superior to those with low asphalt binder contents. In fact, all the HMA mixes ranked #1 to #5 have asphalt binder contents over 6,0%, while this parameter (asphalt binder content) is less than 6,0% for all the HMA mixes ranked #6 to #13. Not discounting other mix design variables that have an influence, such as the aggregate gradation, aggregate type and the voids in the mineral aggregate (VMA), these results do indicate that asphalt binder content has a strong influence on the ductility potential and fatigue crack resistance of HMA mixes. In general, the variability in the test results (measured in terms of the CoV) was not unreasonable, particularly if a CoV threshold of 30% is used. Nonetheless, there was comparatively higher variability in the DT results for the coarse- to open-graded HMA mixes, presumably due to their poor AV distribution and internal microstructure. Furthermore, variability was observed to be highly related to the sample fabrication and set-up processes. In general, the coarse-graded mixes were found to be comparatively more difficult to work with in the laboratory and it was more difficult to fabricate the samples. Ensure uniform AV distribution in the specimen through proper HMA mixing and moulding procedures. Exercise extra caution when mixing and moulding coarse-graded mixes. Minimise HMA heterogeneity in the specimen. Ensure that the end surfaces of the specimens are parallel. Ensure that the attachment plates for the specimens are always clean and that the glue cures fully prior to testing. Make sure the specimen is centrally aligned along the axis of loading to minimise the induction of residual stresses which can lead to erroneous results. In general, being meticulous with the sample preparation and set-up processes is one of the key aspects towards optimising the repeatability and accuracy of the DT test. However, this is not to discount the fact that tension tests for HMA mixes, by virtue of their loading configuration, are typically associated with greater variability and poor repeatability when compared with, say, compression loading tests. The DT test discussed in this paper is no exception. In addition, the DT test is prone to edge failures in the specimens, particularly where the gluing is imprecise and/or the AV distribution is highly non-uniform in the specimen (i.e. high air voids at the specimen edges). The dense- to fine-graded HMA mixes with high asphalt binder contents exhibited better ductility potential and laboratory fatigue crack resistance, based on the εf > 3 000 µε threshold. The coarse- and open-graded HMA mixes exhibited poor ductility potential and laboratory fatigue crack resistance, based on their lower εf values, with εf< 3 000 µε. 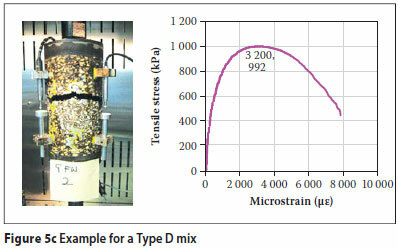 The tensile strain of the HMA mix at maximum stress was observed to be inversely related to the tensile strength of the mix. The higher the strength, the lower the tensile strain and vice versa. Using the εf (and σt) properties, this paper has demonstrated that the DT test can be utilised to comparatively characterise and rank the ductility and fatigue crack resistance potential of various HMA mixes in the laboratory, at ambient temperature. Supplemented with the OT test results, the εf > 3 000 µε pass-fail criterion was found to be a promising threshold for discriminating between HMA mixes that are considered to be fatigue crack resistant and those that are not, in the laboratory. The average maximum failure tensile load (Pmax) was found to be 6,1 kN, with a range of 1,9 kN (fine-graded mixes) to 11,3 kN (coarse-graded mixes). The tensile strength ranged between 248 kPa (fine-graded mixes) and 1 393 kPa (coarse-graded mixes), with an average of 762 kPa. The εf ranged from 1 205 µε (coarse-graded mixes) to 10 636 µε (fine-graded mixes), with an average of 4 180 µε. 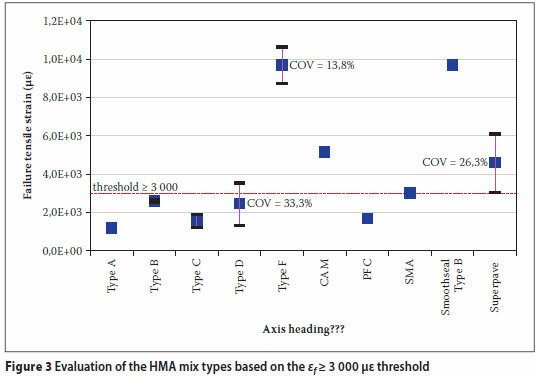 Due to their relatively poor AV distribution and internal microstructure, the coarser and open-graded HMA mixes exhibited greater variability in the test results compared with the dense- and fine-graded HMA mixes. These mixes also exhibited the poorest workability characteristics in the laboratory. In general, the variability in the test results was observed to be highly correlated to the AV variability. On a comparative basis, although the DT test is conducted much more quickly than the OT, the DT test specimen preparation and set-up process is more laborious and meticulously demanding than for the OT test specimens. Nonetheless, both tests provided a comparable laboratory ranking of the mixes, based on their respective pass-fail criteria. Overall, this study has demonstrated that the DT test has promising potential as a surrogate fatigue crack test for characterising the HMA ductility and fatigue crack resistance potential in the laboratory; for mix screening. The laboratory test results obtained were statistically plausible and reasonably correlated with the results of other crack tests, such as the Overlay Tester. However, improvements still need to be made to the DT test protocol, in particular to the specimen fabrication and test set-up, which are meticulous and laborious processes. Furthermore, this research study was purely laboratory-based and, as such, field correlation of the results to validate the DT test protocol, including the pass-fail criterion utilised, is strongly recommended. In general, further research is still required to expand and validate the applicability of the DT test, the analysis models and the pass-failure criteria, beyond the mixes evaluated in this paper. While the current DT test protocol may be useful at the HMA mix design stage in terms of screening mixes in the laboratory, caution should be exercised when it is applied for pavement design and performance predictions. As elaborated on below, many other interactive variables will need to be considered. Lastly, it must be emphasised that laboratory testing and material characterisation for the screening and ranking of HMA mixes as demonstrated in this paper is just one aspect of optimising HMA performance in terms of fatigue crack resistance. The ultimate field performance is also a function of many other interactive factors, such as the pavement structure (i.e. layer thicknesses), traffic, environmental conditions (i.e. temperature, moisture, etc) and construction effects (i.e. construction methods and quality control). That is to say, sufficient HMA mix design characteristics alone will not guarantee satisfactory field performance. All other influencing variables need to be considered. The authors are grateful to all those who provided support (financial [TxDOT] or technical) in the course of this research work. In particular, special thanks are due to Vivekram Umashankar, Jeff Perry, Rick Canatella, Lee Gustavus and Tony Barbosa for their laboratory assistance. The contents of this paper reflect the views of the authors who are solely responsible for the facts and accuracy of the data presented herein. The contents do not necessarily reflect the official views or policies of any agency. This paper does not constitute a standard or specification, nor is it intended for design, construction, bidding, contracting or permit purposes. Trade names were used solely for information purposes and not for product endorsement. LUBINDA F WALUBITA holds a PhD, an MSc (Eng) and a BEng degree in Civil Engineering from the Texas A&M University, the University of Stellenbosch and the University of Zambia respectively. He currently works as a Research Scientist for the Texas Transportation Institute (TTI) of The Texas A&M University System. His area of specialisation is roads, materials, and pavement engineering. His other research interests are in transportation modelling, nanotechnology and the reuse of waste materials. He also has substantial industrial experience as a road engineer, including designing, construction/rehabilitation, QC/QA testing, non-destructive testing, material characterisation, management and performance evaluation. GEOFFREY S SIMATE has a BEng Hon degree in Chemical Engineering from the University of Birmingham and an MSc (Eng) degree in Chemical Engineering from the University of the Witwatersrand. Geoffrey currently lectures in chemical engineering design in the School of Chemical and Metallurgical Engineering at Wits. His research interests are in the areas of nanotechnology and biotechnology. His main research focus is the production of carbon nanomaterials for water treatment and purification, cell immobilisation, brewing, drug delivery and road materials. He has more than ten years of industrial experience as a process engineer. JEONG HO OH obtained his Bachelor's (1997) and Master's (1999) degrees in Civil and Environmental Engineering from Korea University in Seoul. He also holds a PhD (2004) from the Texas A&M University with a specialisation in pavement engineering and is a registered Professional Engineer in the State of Texas. Since 2005 he has been a Research Engineer at the Texas Transportation Institute. His experience covers pavement performance modelling, evaluation, non-destructive testing and material characterisation. Besides his Texas projects, Dr Oh also works actively with the Florida DoT (US) to implement the MEPDG for their flexible and rigid pavement designs.